My wife and I were walking with friends in downtown Harrisonburg, VA one afternoon when we happened upon this scene. This old, rusty signpost still stood in front off a remodeled office building. We wondered why they didn’t either restore the pole as well or just take it down. Then I looked up. This pair of display lights stared back at me. I wondered what sign they had once illuminated with their soft, incandescent bulbs blazing away in the night sky. This rusty light pole stood as both a testament to the past and as a work of urban art to the present. 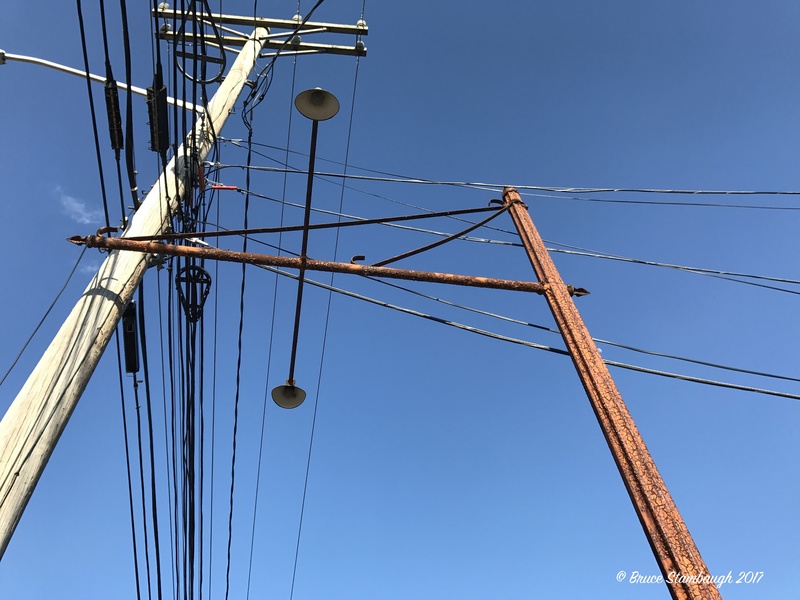 In a way, the pole with its twin lights, long dormant, stood in stark contrast to the ugly utility pole and wires that now overshadowed this relic from yesteryear. “Past Meets Present” is my Photo of the Week. This will be fun for me to see things you spot and photograph around town! Here, could it be that the old pole serves to support the new?? At least that is how I’m viewing my life as I get a wee bit older. 🙂 Or are they not attached?? No, they aren’t attached. I was surprised that the city and/or utility companies didn’t require the pole to be removed. Apparently, it is too short to be considered a hazard.